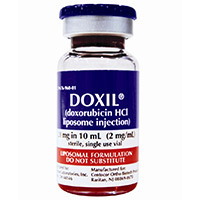 Doxorubicin HCl (liposomal) 2mg/mL; dispersion for IV infusion after dilution; preservative-free. Ovarian cancer refractory to platinum-based chemotherapy. Give by IV infusion at initial rate of 1mg/min; may increase rate to complete infusion over 1hr if no infusion reactions occur; may premedicate with antiemetics. 50mg/m2 once every 4 weeks; continue for at least 4 cycles as tolerated. Hepatic dysfunction (serum bilirubin ≥1.2mg/dL), hand-foot syndrome, hematologic toxicity (esp. ANC, platelets), or stomatitis: reduce dose. Consider total anthracycline and anthracenedione doses and irradiation when calculating total cumulative dose. See full labeling. Not substitutable on a mg/mg basis with other doxorubicin products. Cardiomyopathy (including left ventricular failure), acute infusion-related reactions, myelosuppression may occur. Have medications to treat infusion-related reactions and resuscitative equipment available. Hepatic impairment. Monitor blood (esp. CBC + platelets), hepatic (esp. SGOT/SGPT, alkaline phosphatase), and cardiac function (eg, MUGA, ECG). Monitor periodically for secondary oral cancers with long-term use. Avoid extravasation. Embryo-fetal toxicity. Use effective contraception during and for 6 months after last dose. Pregnancy (Cat.D); avoid. Nursing mothers: not recommended. Caution with cyclosporine, phenobarbital, phenytoin, streptozocin, digoxin, myelosuppressants, others. Previous mediastinal irradiation, cyclophosphamide, other cardiotoxic drugs: monitor for cardiotoxicity and hepatotoxicity. Asthenia, fatigue, fever, anorexia, nausea, vomiting, stomatitis, diarrhea, constipation, hand and foot syndrome, rash, neutropenia, thrombocytopenia, anemia; infusion reactions, cardiovascular events (eg, cardiomyopathy, CHF, acute LV failure), recall of skin reaction from prior radiation therapy, toxoplasmosis, urine discoloration (red/orange). AIDS-related Kaposi's sarcoma refractory to combination chemotherapy. Give by IV infusion at initial rate of 1mg/min; may increase rate to complete infusion over 1hr if no infusion reactions occur; may premedicate with antiemetics. 20mg/m2 once every 3 weeks. Hepatic dysfunction (serum bilirubin ≥1.2mg/dL), hand-foot syndrome, hematologic toxicity (esp. ANC, platelets), or stomatitis: reduce dose. Consider total anthracycline and anthracenedione doses and irradiation when calculating total cumulative dose. See full labeling. Multiple myeloma, in combination with bortezomib, in patients not previously treated with bortezomib and who have received at least one prior therapy. Give by IV infusion at initial rate of 1mg/min; may increase rate to complete infusion over 1hr if no infusion reactions occur; may premedicate with antiemetics. 30mg/m2 on day 4 of each cycle following bortezomib (see full labeling for bortezomib dose); may treat for up to 8 cycles. Hepatic dysfunction (serum bilirubin ≥1.2mg/dL), hand-foot syndrome, hematologic toxicity (esp. ANC, platelets), or stomatitis: reduce dose. Consider total anthracycline and anthracenedione doses and irradiation when calculating total cumulative dose. See full labeling.